C.J. Erickson Plumbing Co. Launches New Website As Company's 110th Year Gets Underway | C.J. Erickson Plumbing Co.
2016 kicks off C.J. Erickson Plumbing Co.’s 110th year in the business of commercial plumbing and site work. The C.J. Erickson team takes great pride in its history and accomplishments over the last 110 years. The mission remains to “be the best company to work for and the best company to work with.” Period. The sound business principles, work ethic and respect for the environment that were instrumental in the company’s founding still guide the team today. How does C.J. Erickson Plumbing Co. manage to set itself apart from the other plumbing companies? It delivers service excellence and combines quality with efficiency to get the job done right, on time and at a fair price. Not only is C.J. Erickson there for its customers and employees, but it also supports its local communities. C.J. 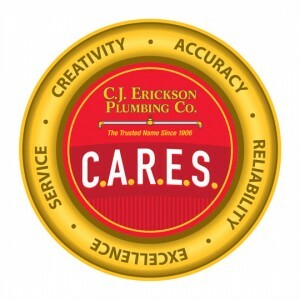 Erickson Plumbing Co. C.A.R.E.S – it is committed to Creativity, Accuracy, Reliability, Excellence and Service. The company’s experience over the last 110 years has played a large part in the launch of their new website. It has learned to always put its best foot forward – pay appropriate tribute to how it all began and showcase its expertise in the industry. Updating its web presence regularly is a strong and necessary approach to take in order to truly portray who the company is and what it is capable of. A milestone such as this was the perfect opportunity for the company to revamp their website. To learn more about C.J. Erickson Plumbing Co. be sure to visit their newly updated website at cjerickson.com.